The more I learn about Kim Kardashian's daughter, North West, the more I realize we have everything in common. We both enjoy the finer things in life, like nap time and cookies. We both find fashion shows achingly dull. And now, I know we also share the same favorite Disney movie. This week, North West was spotted pulling a Frozen suitcase through the Paris airport alongside her newly blonde mom, and it's basically the most precious thing you've ever seen. Although I'm partly surprised North doesn't already have people to do things like that for her, I'm proud to see she's already a self-sufficient, independent woman... even though she hasn't even turned two years old yet. In fact, more and more often, North West has started looking less like a baby and more like a tiny Kardashian-in-training. This could be attributed to the fact that her parents choose to dress her like a demure child model, or because she's being raised in an environment that's way different from what most toddlers experience — you know, Cheerios, daycare, barfing all over their moms. I'm pretty surprised Kim let the Frozen suitcase fly, since I'd imagine she'd pick something out for her to carry that's designer, not Disney. And even though her tiny suitcase is covered in glitter, she's dressed in all black and looks like she fits in with her aunts perfectly. And her KUWTK training? It's been happening since she was born. To be an official Kardashian, North West has to learn that she simply does not deal with commoners, unless they're people like Malika Haqq or Jonathan Cheban. She'll need to learn how to associate with the actors, musicians, and moguls who run in her parents' circles, and, of course, their children. I'm honestly surprised she hasn't already exchanged friendship bracelets with Blue Ivy at her mothers' insistence. If you've noticed, since Kim and Kanye West have been a thing, various members of the Kardashian/Jenner clan have been cursed to a life of wearing Kanye-inspired and designed apparel, especially if it's touting one of his recent tours. North West, who is constantly spotted in her Yeezy tour jacket, is more than aware of this fact. Just as Mom, Aunt Khloe, and Aunt Kourtney get tired of Grandma Kris' hijinks, often in the interest of her own self-promotion, North is so done, too. This look on her face screams "Get this woman off of me before she forces me into a spin-off!" Since the Kardashians are all about fashion — and Dad Kanye West is too — North must accept she is just going to have to attend Fashion Week on all continents every year and try to look happy about it... something she's failed at so far. It's fine, North. I'm not a fan, either. 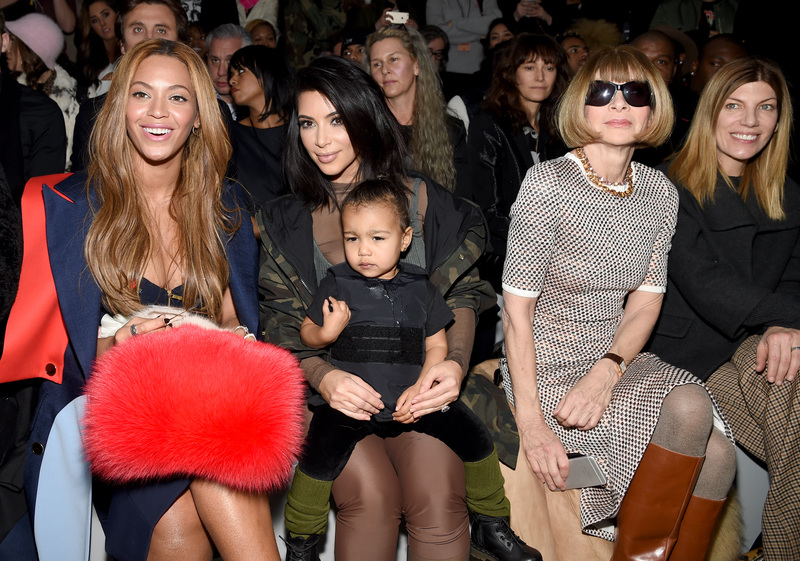 There are only a handful of babies who carry Chanel, and North is one of them. She's so #blessed. Even though she can't yet grasp the concept of taking a photo of herself through a front facing camera, Kim's obviously already trying to teach her via including her in her own selfies. The selfie obsession runs strong in this family, and I guarantee that by the time North turns five, she will have her own Instagram account featuring only her face and close up photos of the faces of her Barbies.